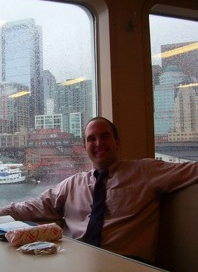 Allen Dieterich-Ward is an Associate Professor of History at Shippensburg University in Pennsylvania. His 2015 book, Beyond Rust: Metropolitan Pittsburgh and the State of Industrial America (UPENN Press) examines the shifting economic fortunes of metropolitan Pittsburgh, a region that stretches well beyond the city’s immediate boundaries to include swaths of Southwest Pennsylvania, West Virginia and Ohio. The fascinating work blends political, social and environmental history as it explores the relationship between an urban center and its hinterlands. Of particular note for those interested in landscape conservation are Dieterich-Ward’s case studies of diverse communities’ responses to the upheavals of deindustrialization and revitalization. 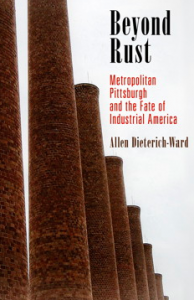 LLO: What is the big question you were trying to tackle in Beyond Rust: Metropolitan Pittsburgh and the Fate of Industrial America? Dieterich-Ward: The big philosophical question I set out to address in writing Beyond Rust was “how do physical and social landscapes shape identity?” In the region of northern Appalachia you see a distinct regional culture emerge in the late 19th century with its own mix ethnic enclaves, economic foundation in steel, coal, glass and railroad, even dialect (“Pittsburghese”). This had a lot to do with the region’s topography, which separated the Upper Ohio from the East and channeled community development into particular patterns. Further, while never a universal, the “Smoky City” motif defined what it meant to be from Pittsburgh and the smaller communities in its hinterland – an underlying regional identity that continues in some fashion through the present. The slow decline of heavy industry beginning as early as the 1920s frayed this sense of place and common identity even as the dense network of river and rail transportation gave way to a more decentralized land, highway-oriented land use pattern. My real goal in writing the book was to understand the ways in which changes from the 1940s on created a “region of contrasts” in which some aspects of the earlier regional identity remained while at the same time communities went in different directions economically and culturally. The recent election of Donald Trump really brought this regional bifurcation, especially between deindustrialized areas of high poverty and out-migration and those thriving areas associated with Pittsburgh’s “eds and meds” economy. LLO: What got you interested in writing a book that dealt with an entire region (some might even argue multiple regions) rather than a single city or town? Dieterich-Ward: I grew up in a coal and farming area on the edge of metropolitan Pittsburgh and so my perspective has always been from the outside looking in, not just from the city looking out. Writing a narrative-driven book about a whole urban region is pretty hard and is not often attempted by historians (probably for good reason!). I had to make a lot of decisions about how to keep moving forward the overall story while tying in specific communities and people that could serve as stand-ins for broader groups and issues. As difficult as this was to pull off at times, I felt that this approach was necessary to really get at the complicated dynamics that shaped Pittsburgh over the course of the twentieth and early twenty-first centuries. Pittsburgh rose to industrial prominence only be harnessing the resources of its hinterland and integrating people and processes from the urban core to the milltowns of the river valleys and to the rural mining camps. The increasing wealth gap of today is an important reminder that it is remains just as important for the continued vitality of the city to ensure that new relationships are forged that can create vitality throughout the region. LLO: What role does “heritage” play in the story of postwar Pittsburgh and the surrounding communities? Dieterich-Ward: Since the 1960s, heritage-based community development has been a key component of the revitalization of many urban neighborhoods in Pittsburgh. It makes sense that in a book focused on understanding of residents construct identities based on their physical and social landscapes that I spent a significant portion of several chapters exploring the ways in which groups like the Pittsburgh History and Landmarks Foundation (PHLF) and Victorian Wheeling, Inc. sought to preserve and use the built environment to nurture a sense of community identity and foster economic growth. Of course, “heritage”-based development is hotly contested terrain and you see many communities in the region struggling in how to balance the adaptive reuse of both individual sites and larger infrastructure (think riverfront wharves or railroad terminals) with economic and technological changes that privilege new construction often in greenfield sites. One of the most interesting examples of this, I think, is the creation of an extensive rail-trail network by adapting what are essentially linear brownfields into multi-use transportation corridors with residents relying on the trails for everything from recreation to commuting for employment. At their best, these trails, which often connect across both wealthy and poor neighborhoods, can empower people and communities with a sense of a common past (highlighting the need for effective on-trail narration) and a common present by redirecting attention back to older neighborhoods not well served by highways. LLO: Why might a professional working in environmental conservation or historic preservation be interested in reading Beyond Rust? Dieterich-Ward: Because of the regional framework of the book, I was able to compare and contrast how communities with similar backstories had different experiences with both environmental conservation and historic preservation. For example, in chapter 5, “We’re Appalachia But We Don’t Need to Be,” I focus on the evolution of rural communities in the region with a particular focus on Barnesville, Ohio and Ohiopyle, Pennsylvania. Both areas end up seeing major population loss and economic decline, before the arrival of Pittsburgh-based interests that promise economic growth, but require the removal of residents from large swaths of the local area. In Barnesville this took the form of an enormous coal surface mine, while much of downtown Ohiopyle was razed to make way for a massive state park. Examining the competing economic, environmental and cultural narratives at play in each community provides fascinating similarities for land uses that seem to be diametrically opposite. In the case of historic preservation, Pittsburgh really formed one of the key national success stories for connecting historic preservation and economic development. Much of what attracted and retained the talented and highly-educated people that made possible Pittsburgh’s post-industrial Renaissance was connected in one way or another to the sense of place that was brought about by conserving its building stock. Spearheaded by the PHLF, a powerful partnership emerged in the city to support heritage-based preservation. Other communities in the region, however, have had a hard time in mustering the political and economic capital necessary to launch community development initiatives of this type. For example, I devote significant space to exploring the experiences of Wheeling, West Virginia in trying to use the Pittsburgh model in fostering its own revitalization. While the city has had some successes, it has been quite difficult to match the resources of its larger neighbor with the result that significant numbers of gorgeous Victorian homes are left to decay and eventually be condemned for lack of investment. I think there is a great deal to be learned and applied in other regions from these divergent experiences in understanding the opportunities and limits of both conservation and historic preservation. LLO: What’s your current research project? Dieterich-Ward: My current research is going in two directions. First, I’m exploring the intersection of energy and environmental politics since the passage of the Clean Air Act in 1970. I’m particularly interested in the ways in which the politics of clean air differed across regions depending on the relationship to different types of coal production and the experience of pollution from power plants. Second, I am working my friend Aaron Cowan, author of A Nice Place to Visit: Tourism and Urban Revitalization in the Postwar Rustbelt (2016), on the role of historic preservation in community development in Pittsburgh. As early as 1970, the National Trust for Historic Places declared Pittsburgh “a preservation laboratory” that avoided ‘‘shunt[ing] off the poor to faceless projects” and we envision this project as really demonstrating the significance of the city as a national model in multiple aspects of heritage-based development over several decades.